For Group reservation, with 6 or more guests, can be modified or cancelled free of charge up to 14 days. We will charge the full amount of the reservation for cancellations within 14 days prior of arrival. Babila Hostel is the best solution for both travellers and locals that can meet up and participate in many events. It is not only a comfortable hostel, but also a well-designed place where you can feel free eating, cooking, chatting, laughing, working, enjoying and exploring together new cultures. In a few words, sharing and feeling like part of a big family! In the Hostel, you can find several common areas that allows joining your stay with daily cultural activities: playroom, based on four floors, all inspired by the major attraction. 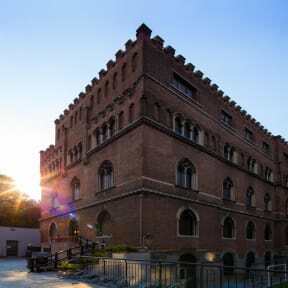 It is hosted in a 20th century building next to Milan Conservatory, in a typical Italian Tudor style. 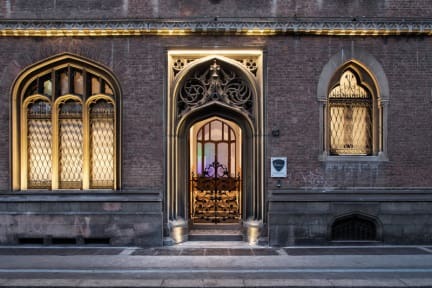 We are located in the heart of Milan. Milan Cathedral is only 10-minute walk from Babila Hostel. Milan Linate Airport is 7 km away. Check-in is available 24 hours. Babila Hostel offers 17 well-equipped rooms; familiar dormitory each one with private bathroom, based on the four floors, all inspired by the major Italian designers. Child friendly. Only allowed with adults. 1 child per room allowed. If you lose the locker key, there is a 10.00 EUR penalty, and 5.00 EUR for the badge. The Babila Hostel provides full accessibility to people with disabilities, including sanitary facilities. Laundry Service: 5,00 EUR for 45 min. Drying and drying, washing liquid included. Bed linen will be changed after 7 days (if it is a long stay). In the case of a specific request by the customer to change bed linen, the cost of the service is 5,00 EUR. Breakfast timetable: From Monday-Friday from 7:30 – 10:30AM every day. Nice place to stay in with good staffs. 1st class good variety at breakfast and lively music some evenings . the check in process was smooth, all the staff were very friendly. the first night it was hard to sleep because someone in the room was snoring loudly, but thankfully front desk had earplugs prepared so the second night was not a problem. location was great, close to tram lines and to the duomo. there’s a good variety of food available for breakfast, really thoughtful! This was definitely the best hostel I've stayed at, from the friendly and helpful staff, to the clean and big bathrooms in each room. It's well located and the facilities were great. We loved our stay at Babila and hope to be back soon! Very good hostel in convenient location within short walk of Milan centre. Good facilities and excellent breakfasts. Beautiful building. Helpful staff . It was a great experience EXPECT for the fact that our room was on the main floor and the bar music was on every night until midnight, wasn'T abig problem though but next time I would definitely request a room on the other floors. Beds were clean, rooms were nice and bright, and the lockers are a decent size for a carry on. The showers in my room were the issue -- the one had a clogged drain and so I would have to turn it off between lathering to avoid a flood, the second was a fault head that did not let enough water fall. Good space, good location, just something to be aware of.